Purple is a solution that delivers smart and valuable analytics for physical spaces, enabling businesses to promote their brand, products, and services better than ever. Easy to use and implement, this cloud-based platform is an ideal application for stadiums, retail, shopping malls, hospitality and dining, healthcare, and more. With Purple, you are using your WiFi to have a better understanding of the people who move in and around your venue. The system retrieves all relevant data from multiple sources and provides you with the tools you need to fully evaluate indicator such as foot traffic, dwell times, and bounce rates of your physical space. Equipped with real-time information and actionable insights, Purple allows you to take the best action to promote your products and services to people who are in your venue. You can target them with powerful and effective marketing content via email, SMS, and customizable splash pages. Purple provides businesses and organizations more than smart analytics of their physical spaces. The platform delivers them the information they need to fully understand their customers and visitors, giving them the best and high actionable insights to further enhance and intensify their marketing efforts and generate more revenue for their business. With Purple WiFi Solutions, your customers are granted secure and legal access to your WiFi, where you provide them with a controlled and branded browsing journey. You can steer you social engagement through the ceiling. The Purple Portal gives you a very comprehensive means to track your visitors and actively market your brand. Login (splash) pages can be tailored to display a particular product or advertising material. You can also send targeted emails and SMS containing your marketing content. You also have absolute control over the URL redirect page they land on, ensuring a seamless and consistent transition. Stadiums, retail stores, and malls among other physical spaces will greatly benefit from Purple Location Services. Business in the said and similar industries will lobe how they can boost their revenue using Purple location capabilities, from real-time heat mapping and analytics to zone based marketing. You are able to identify how your customers move around your venue, where they converge, where they stay the longest, and areas where they don’t visit. Entry and exit points, bottlenecks, and queue lengths are all visible. You even have access to historical data to analyze behavior patterns and trends. What Problems Will Purple Solve? Today, successful businesses make the most noise about their customer experience, and guest WiFi should play an integral part in this. Make it beautiful, branded and seamless for customers to login just once across all your venues and you’re on to a winner. Turn on social login too, and drive your social engagement through the roof. This cloud software provides an overlay over existing hardware and can be up and running within an hour. With our ‘Purple Portal’, you can access a wealth of information collated from the Purple system. This analytic platform provides real-time customer data and insight. Secure and available at any time, a vast array of tools will help you analyze and segment your audience Real time data can be accessed at any time. User demographics such as age, gender and location, length of internet use, total amount of users and data usage are just some of the statistics you can collect. This cloud platform helps you understand how people move around your venue. The paths they take, choke points, entry or exit points and even queue lengths are not only possible but made easy with the Purple Portal. Imagine monitoring queue depths in real time and being alerted when thresholds are approaching or met. How about analyzing historic venue data to understand behavior patterns and allocating business resources. Purple can bring together any data point from any source, from GPS to WiFi to Bluetooth, there’s a whole lot of rich data available out there to be collected. Purple makes it simple, beautiful and actionable. 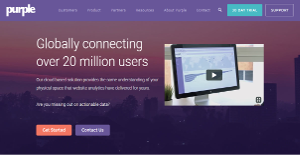 If you are interested in Purple it could also be a good idea to check out other subcategories of Best Business Intelligence Software gathered in our base of SaaS software reviews. Since each organization has particular business wants, it is advisable for them to desist from searching for a one-size-fits-all ideal software solution. Needless to say, it would be useless to try to find such a platform even among market-leading software platforms. The intelligent thing to do would be to list the various important factors that need consideration such as main features, finances, skill levels of staff members, company size etc. Then, you should do your research thoroughly. Read some Purple reviews and look into each of the other systems in your shortlist in detail. Such comprehensive research can make certain you reject ill-fitting platforms and choose the system that offers all the features you need for business success. Purple offers a variety of enterprise licensing options for all their products. Contact them for more information or sign up for a 30-day free trial. We realize that when you make a decision to buy Business Intelligence Software it’s important not only to see how experts evaluate it in their reviews, but also to find out if the real people and companies that buy it are actually satisfied with the product. That’s why we’ve created our behavior-based Customer Satisfaction Algorithm™ that gathers customer reviews, comments and Purple reviews across a wide range of social media sites. The data is then presented in an easy to digest form showing how many people had positive and negative experience with Purple. With that information at hand you should be equipped to make an informed buying decision that you won’t regret. What are Purple pricing details? What integrations are available for Purple? If you need more information about Purple or you simply have a question let us know what you need and we’ll forward your request directly to the vendor.